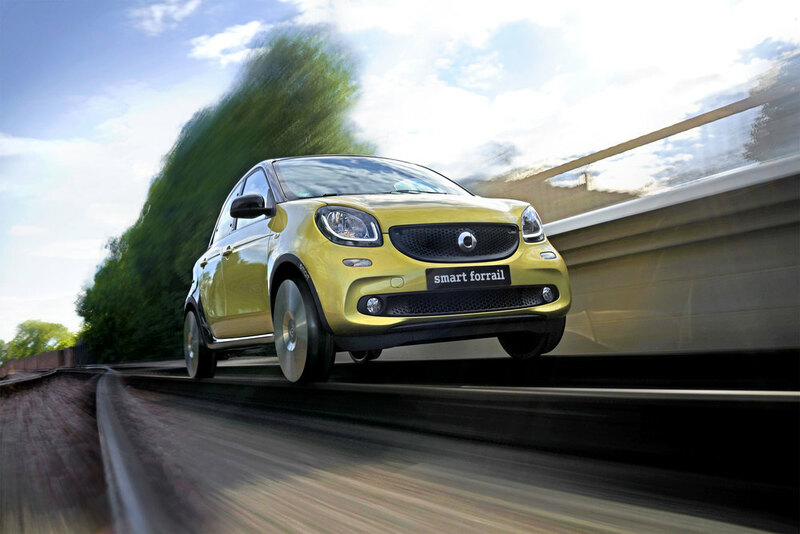 smart has revealed a special 'forrail' in a one-off experiment. The smart forfour is described by the Mercedes-owned brand as the 'ultimate commuting machine' yet as it is reliant on roads, smart admits the train has an obvious advantage in that it can get from point-to-point through a more direct route. With this in mind, engineers set up a light-hearted, one-off experiment to redressed the balance and see if the two could be combined. Nicknamed the forrail, it might appear like a lightly modified forfour but it is, in fact, a fully certified mini-train, says smart. The car's tridion safety cell underpins the forrail and to avoid any steering movement, aluminium supports were welded between the axles meaning the wheels are locked in position. Following six months of engineering work and sophisticated CAD modelling, the smart forrail comes equipped with unique, solid steel wheels each measuring 22-inches in diameter and weighing 80 kg, allowing it the traction it needs on rails. Designed by Interfleet, a specialised British train engineering business based in Derby, the team - who usually work on 16-litre, 70-tonne diesel locomotives - had to employ a new approach to the challenge presented by a 999 cc, one-tonne smart. Under close supervision, the smart forrail tentatively took to the tracks on the privately operated Bluebell Railway. Tackling the 10-mile stretch of railway cutting through Sussex the experimental 'train' successfully completed its test, much to the surprise of some local trainspotters.